Sanford High School report card for seventh-grader Versa Woodcock during the 1908 spring term. Students were evaluated in subjects such as arithmetic, reading, spelling, grammar, history, geography, and physiology. The principal during that school year was N. J. Perkins. Original report card by Alice M. Tetherly, 1908: Private Collection of Christine Kinlaw-Best. 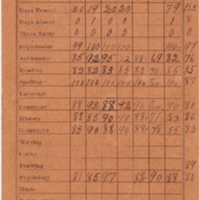 Digital reproduction of original report card by Alice M. Tetherly, 1908. Kinlaw-Best, Christine. Interviewed by Mark Miller. UCF Public History Center, HAR 1063414P. March 2, 2013. Audio/video record available. UCF Public History Center, Sanford, Florida. Parent or Guardian, please examine, sign in the proper space, and return to the teacher at once. If the number 70 appears one or more times on the face of this report, a consultation with the teacher will be advised. “Sanford High School Report Card for Versa Woodcock, Spring 1908.” RICHES of Central Florida accessed April 22, 2019, https://richesmi.cah.ucf.edu/omeka/items/show/1545.